Can't attend? Follow Google Business Group (GBG) Sarawak to know of future events! 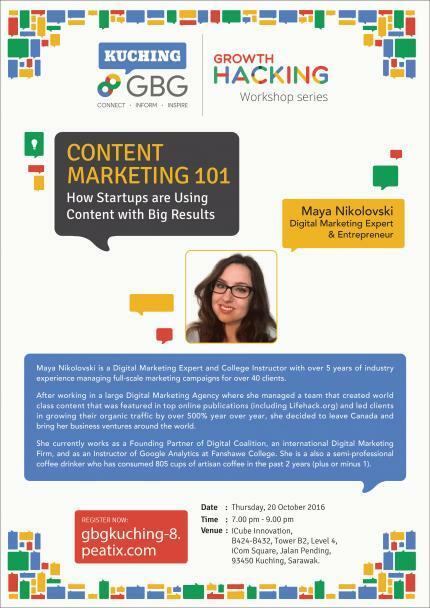 Get to know more about Content Marketing with Maya Nikolovski. Maya Nikolovski is a Digital Marketing Expert and College Instructor with over 5 years of industry experience managing full-scale marketing campaigns for over 40 clients. After working in a large Digital Marketing Agency where she managed a team that created world class content that was featured in top online publications (including Lifehack.org) and led clients in growing their organic traffic by over 500% year over year, she decided to leave Canada and bring her business ventures around the world. She currently works as a Founding Partner of Digital Coalition, an international Digital Marketing Firm, and as an Instructor of Google Analytics at Fanshawe College. She is a also a semi-professional coffee drinker who has consumed 805 cups of artisan coffee in the past 2 years (plus or minus 1).